Cyclists who plan to ride Upper Peninsula trails this summer might want to make a stop in the Marquette area where an interesting rail-trail project will be dedicated with a ribbon-cutting ceremony on August 15. 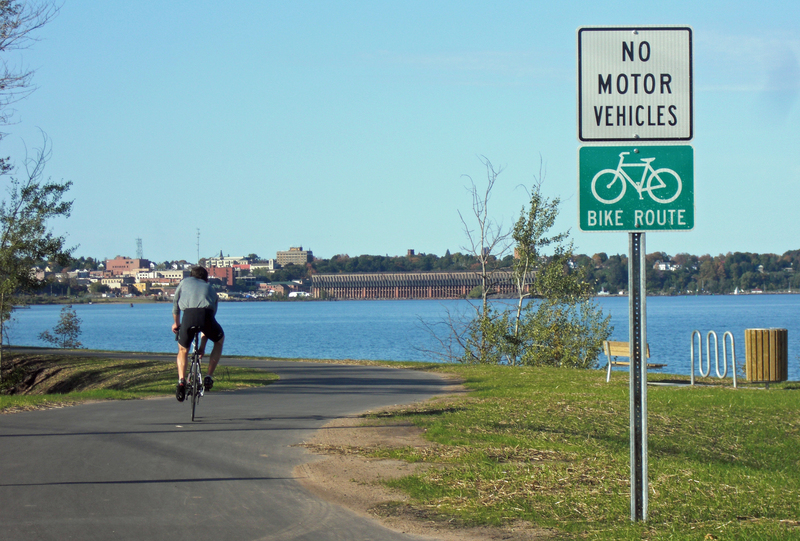 A new 12-mile section of the Iron Ore Heritage Trail, between Marquette and Negaunee, will be open for riding and connect the towns, giving cyclists a 29-mile route from Chocolay Township, east of Marquette, all the way to Ishpeming. That is more than half of the 46-mile route planned from Chocolay to Republic when it’s finished, a ride through some great Upper Peninsula countryside. “People are very excited about it. This is a big piece of trail that will connect two population centers,” said Carol Fulsher, the administrator for the recreation authority that was created to administer the trail. The dedication, she said, will take place at 3 p.m. at the Old Towne Trailhead in Negaunee. The Iron Ore Heritage Trail runs through iron country, better known as the Marquette Iron Range, a portion of the UP where iron mining historically was big business and where its presence impacted the land and people of the area. Those stories, of the mines and of the people, are all to be part of the trail, according to organizers. A series of interpretive projects are being installed along the route with 17 already installed. Like most trails, the IOHT’s the construction costs are covered in large part by a mix of state Natural Resources Trust Fund dollars and federal transportation grants. However, most of the communities along its length raised $2 million in local funds for it by passing a millage. The IOHT will be a hybrid trail, one with paved sections in communities and crushed-granite sections between the towns. That approach is wisely being adopted more and more. It is far less expensive than paving the entire route and still provides communities with paved sections for local rollerbladers or those with strollers. The remaining 17 miles, from Ishpeming to Republic, are open but undeveloped. That means packed dirt for riders, at least until next year when another five miles will be developed, according to Fulsher. The Iron Ore Heritage Trail is one of several rail-trail projects moving this year. The 22-mile Hart-Montague Trail is headed for a facelift, both physically and symbolically. Its name has been changed to the William Field Memorial Hart-Montague Trail. The late Bill Fields, a generous man and former Oceana County commissioner, was instrumental in its development. Fields was a Shelby asparagus and fruit farmer who fell in love with the idea of creating rail trails. He spent $225,000 of his own money to acquire the rail corridor and then donated it to the state. The first half of the trail was built in 1989. The southern half was opened in 1991. State officials say its surface has worn out and they are now seeking grants to pay for resurfacing and widening the entire trail. “It was the state’s first paved trail,” said Jim Radabaugh, the state trails coordinator with the Michigan Department of Natural Resources. “And that surface finally reached its limits. Matt Lincoln, a state park planner and grant coordinator with the DNR said the agency has applied for $4.4 million in grants for the project. There is engineering yet to do so paving is not expected until 2015. Progress is also being made on finishing the Fred Meijer White Pine Trail. Riders could see the last 41 miles improved in 2014. That includes the stretch from Sand Lake north to Big Rapids, and from Reed City to just south of LeRoy. A crushed limestone surface is planned rather than asphalt, according to Radabaugh. That approach is $100,000 per mile cheaper than asphalt. Hybrid surfacing is also planned for next year on the Fred Meijer CIS Trail (Clinton Ionio, Shiawassee) from Owosso to Ionia. That is a 41.3-mile trail and part of a larger 125-mile Meijer trail network that includes the Fred Meijer Grand Valley Trail from Ionia to Lowell; Flat River Valley Trail from Lowell to Greenville; and Heartland Trail from Greenville to Edmore and Alma. Asphalt will be used within communities and crushed limestone will be used between the communities. Radabaugh noted that this is the first time the state is trying it. “Long distance runners and bikers don’t need asphalt, but using it in communities makes sense. We’ve talked with the communities and they agreed,” said Radabaugh. With summer here, there are a number of great trails to ride. If you haven’t seen a copy of Michigan Trails Magazine, you’ll want to get one. It’s great one-stop resource, with maps and trail descriptions for lower-peninsula rail-trails. The magazine is distributed for free in bike shops, State of Michigan Welcome Centers and other travel and tourist information offices. It’s can also be ordered for a fee online. This entry was posted in Uncategorized and tagged Adventure Travel, Cycling, DNR, Fred Meijer White Pine Trail State Park, Hart-Montague Trail, Iron Ore Heritage Trail, Ishpeming Michigan, Marquette, Marquette Iron Range, Rail Trails, State Parks, Trails, Upper Peninsula of Michigan. Bookmark the permalink.